If Val has her way (Mayoress of Cairns) her city will be the festival capital of the world with a film festival to rival Cannes. The similarity in names may just work in favour of Cairns. If the Cairns Film Festival was convened on exactly the same dates as the one in Cannes, MB could easily imagine some literacy challenged travel agents booking travel for festival goers to Cairns, rather than Cannes. 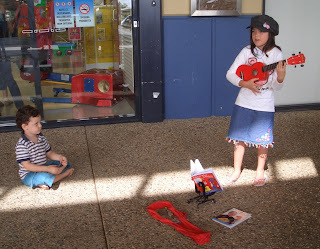 The gutsy 10 year old MB spotted busking with her ukulele at Redlynch Shopping Centre recently would no doubt be happy to hear about a possible ukulele festival in her hometown. The festival would have real credibility if Val has lined up Jake Shimabukuro, ukulele virtuoso, to perform. He is a true master of the ukulele.